The recent hot weather phenomenon has not only brought about a plethora of roof terrace "grill parties" but also seen almost everyone Zurich take to the water. 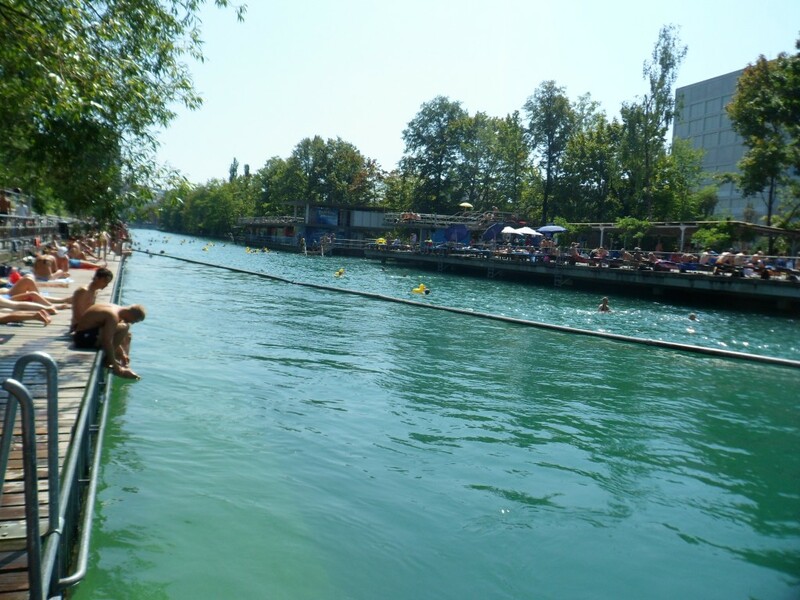 of the summer social scene and on sunny days the river side is packed with people sunbathing rotisserie style inbetween frequent dips, as well as volleyball players, people barbecuing and lots of just general sitting down and hanging out. The laid back beach atmosphere will nearly have you believing that you're at the Costa del sol but without the annoying sand. If you don’t feel like paying out for food at the bars however you can always bring your own or nip over the more northern bridge to the conveniently placed Migros supermarket. Here you can pick up some food from the deli, or snacks and drinks from the very large supermarket located underneath. Sun cream is also an important factor (factor 30)for those of you considering a longer afternoon by the Limmat and while the sun here is not as strong as in the south of Spain for example it still has a good effect, especially on those of us not used to being frequently exposed to anything more than rain.